Our new Bed and Breakfast is located on 10th avenue, just a two blocks from the main plaza and a two blocks from the ocean. 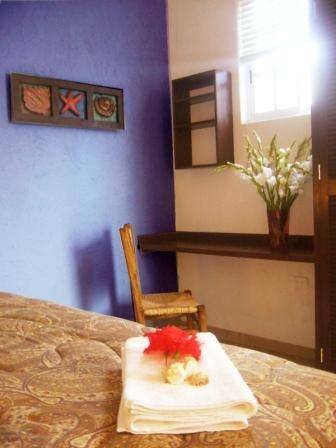 Our rooms are cozy and comfortable and spacious. Two rooms have king size beds... two rooms have single beds which can be moved together to make a king. Linens, beach/pool towels, purified drinking water included. The lounge has satellite TV, DVD player, pocket book library, table games and cards... and is a nice place to meet with the hosts and other guests. Coffee and pastries are available on the terrace by the pool at 7 am. Full breakfast inclues coffee, fresh orange juice and fruits of the season, cereals, yogurt and granola, and a different main dish each day: chilaquiles, banana pancakes, enchiladas, ranchero-style eggs, etc. We will help you coordinate scuba diving (...$50. 00 2 tank dive....) or snorkeling trips, fishing trips (... deep sea.. salt flat.. lagoon..) a visit to a day spa, a golf game, or anything you would like to do. 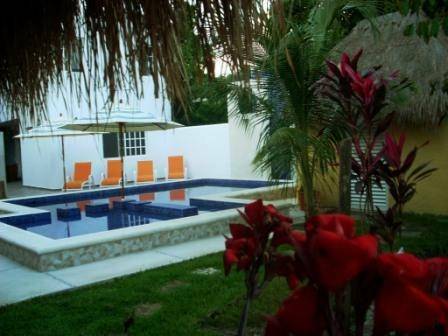 Villa Escondida is a small, family owned and operated bed and Breakfast, and we like to take care of our guests! We look forward to being your hosts while you visit the island. Day use of beach condo when available. 2 rooms have king size beds. 2 rooms have 2 single beds (that can be put together if needed). Rooms have A/C, ceiling fans, closets and desks. The bathrooms are nice and espacious; the showers are big. Hairdryer, towels, etc. 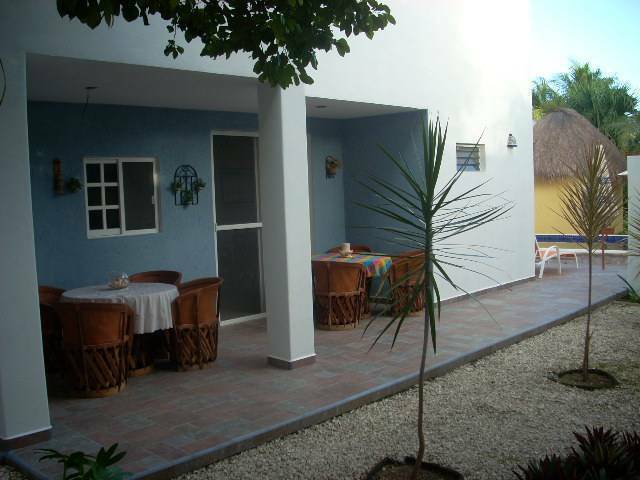 Our Bed and Breakfast is situated in downtown Cozumel, easy access to dive shops, the market, shopping and great restaurants and we are only 2 blocks from the main waterfront avenue, and the Pier. Delicious food! a bit of everything, well priced. Great sea food! Wondeful, small eatery! great coffe, desserts and snaks. Great modern blend-mexican style food. We take a 10% deposit by Pay-Pal and the balance to be paid upon arrival in cash or traveller cheques. (Map on Website). If you are coming to Cozumel via ferry, just walk 2 blocks South of the pier(Pepe's Grill) and then 2 blocks East(LaChoza) and the B&B is on the middle of the block. if you are coming by plane, give the taxi driver the address and he will bring you here. In town, you can take taxis if you don't like to rent a car or a mopped. Public transportation service in Cozumel is not recommended .